My copy of Barack Obama's Dreams From My Father arrived today; I ordered it on November 6, and it took 12 days to ship. Amazon is usually super fast, but I suspect that orders for this book were numerous and backed up. I look forward to reading it soon (I have to finish some other reading first, but I will read it before the inauguration). 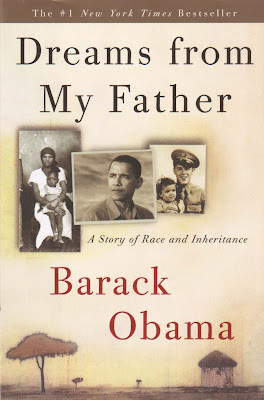 Obama originally published this book in 1995, when he was just 33 or 34. Even then, he was thinking about his legacy and his place in the world. It's rare for a young person to pen a memoir (unless he or she is a celebrity), and from what I have gleaned just from a quick glance, it seems to be a cerebral book. Did he know, even that long ago? Could he see into the future? He certainly ran like a candidate running for his life. Interesting times ahead--both good and bad. Should Congress Bail Out The Auto Industry? I must admit, this proposed automotive bailout sounds like another big government handout that rewards bad behavior and fiscal irresponsibility. My husband and I (and many other citizens) work hard for our money, and we spend what we have responsibly. Does it seem fair that our hard-earned tax money will go to greedy capitalists who couldn't keep their spending in check? Given the current state of the economy, I see why a bailout might be necessary, but I don't have to like it, and I would definitely like to see some MAJOR restrictions placed on how that money should be spent by the industry. These CEOs can whine all they want about government non-intervention (on how the money is to be spent), but they have demonstrated that pure capitalism does not work, that self interest will almost always trump the greater good (which is also why pure communism/socialism does not work either). President-elect Obama and the Congress had better get this one right; otherwise, in two years, we'll see a political massacre of Democrats in both the Senate and House, and in four years a Republican President-elect. 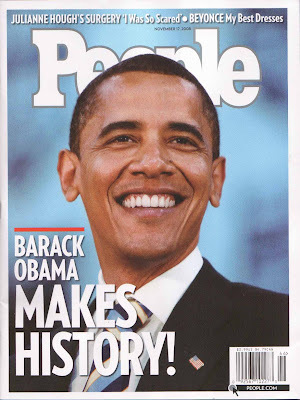 So on January 21, 2009, President Obama had better hit the ground running. --That this is a LOAN, not another bloated government giveaway. --A specified repayment plan, with prevailing interest rates; if payments don't arrive on time, then the government should have the power to begin seizing assets. --Mass firing of the CEOs who took huge incentives and threw big parties at their stockholders' expense and replaced by temporary bean counters whose only job is to lead the company out of its financial morass. These CEOs would be paid well and fairly, but absolutely no bonuses and no golden parachutes should they be fired for a job not done well. And the voters will not hesitate to send the same message to Democrats. Seriously. Your mandate is predicated on the fact that you're not George W. Bush. Part of the bailout should be designated for energy innovation and alternative fuels research. For example, why hasn't the industry been working on fuel cell technology? --The bailout should come with strict government oversight and rules and regulations; every penny needs to documented and accounted for. Government CPAs should be placed on site and be capable of calling for an audit at any time. --No frills allowed, no lavish parties, no fancy cars and clothes. --Union workers will also have to tighten their belts (sorry, but you shouldn't get a free pass here). You will be fairly paid and have good health care coverage, but you may have to forgo yearly raises and other perks, at least until this country is out of the recession. But you will still have jobs; the alternative is the unemployment line. We're all going to make sacrifices, I'm afraid. --If the bailout appears to be failing, the government should not hesitate to step in and take over; after all, it will be OUR tax money being squandered. Aside from the proposed bailout, the Obama administration ought to consider reinstating the "natural monopolies": utilities, mass transit (train, airline, bus, roads), and the postal service. These areas should have never been handed over to the private sector; they are too huge and too necessary to the common good to be left in the hands of profiteers who see only dollar signs. At the very least, these companies should be heavily regulated. The Republicans got into this mess, but it will be up to the Democratic majority to get us out. And if the Dems don't succeed, they will be blamed. "I'm here because someone marched." Barack Obama recognizes the debt he owes his predecessors; without Martin Luther King and the unsung heroes who put their lives on the line, this defining moment in history would not be possible, and quite likely our brilliant President-elect would be working a minimum-paying or low-wage job or, perhaps, even in jail (a fate suffered by most of the early civil rights leaders and writers)--or not even born. "Freedom is never voluntarily given by the oppressor," Martin Luther King once said. "It must be demanded by the oppressed." Sad, but true; those who enjoy the status quo are not likely to give it up for purely altruistic reasons--it happens only when the oppressed begin grumbling and then embarking on peaceful or even violent protest. Or, in the case of Rosa Parks, a simple refusal to give up her seat to a white person. Park's refusal, heard around the world, was a not an intentional political act designed to change the world, but the weariness of a working woman whose aching feet hurt like hell, darn it! I come from an era when Martin Luther King was often vilified for "not knowing his place." Even in the North, I often heard rumblings from both friends and relatives that Blacks needed to "stop all that rabble-rousing." Shortly after MLK's "I Have a Dream" speech, my late grandmother said, "That Rev. King has a bullet with his name on it." Even as a child, I was horrified that someone I loved would even think of such a possibility, but I now understand that she wasn't afraid of King but afraid for him. Even if I didn't, she understood that trail blazers often pay a steep price for their forward-thinking viewpoints. In a sense, Barack Hussein Obama is also a trail blazer, the first African-American to win the highest office. Whatever he does in office will be scrutinized by all ethnic and racial groups. Right now, expectations from the African-American community run high, perhaps too high as Obama tries to placate and unite the entire nation. Yes, he's Black, but he also represents all Americans and will have to work for all groups. "I'm here because someone marched." What a humble statement from a man who is known to have significant high self-esteem (albeit earned) and ego. Hillary Clinton would be a good choice for Secretary of State, but I can think of two reasons why she might want to decline. Second, Clinton might feel that she will be able to wield more power in the Senate, which is probably true. Those concerns aside, she would be a good choice for this cabinet position. And what about Bill Clinton? Might he have a place in Obama's administration (if he can behave himself and stay away from interns)? He is still relatively vibrant, and I wonder if the charming Bill of the 1990's might show up if he held a position of significant power. #67: Huge Expectations? Will Obama be Able to Deliver? 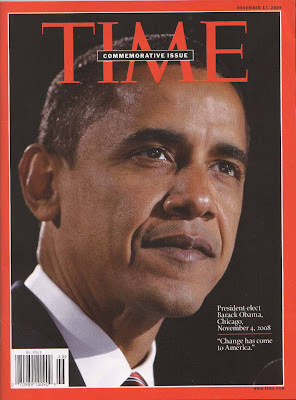 Today, I was mildly amused to see the November 24 cover of Time and predict that it will become more collectible and important than the November 17 election issue cover, a rather straight forward depiction of Barack Obama's November 4 victory. This Arthur Hochstein and Lon Tweeten collaboration is well on its way to becoming a modern classic. 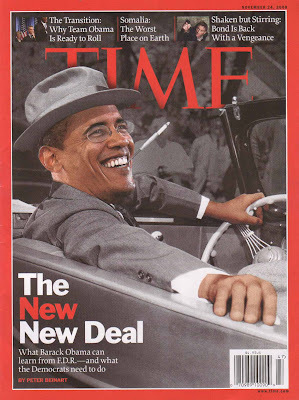 Could there be a little snark behind this photoshopped representation of what our new president will face starting on January 20, 2009? Are the photoshoppers doubting (maybe just a bit) that this 47-year-old greenhorn will be able to live up to the campaign hype? Should the voters expect one human being, albeit one of the most brilliant minds on the planet, to assume the weight of a financial meltdown, two wars, terrorism, environmental disasters, etc. on his narrow shoulders? The Time cover conjures up all kinds of implied fears, specifically, the Big D-word. Are we in a depression or heading there fast? 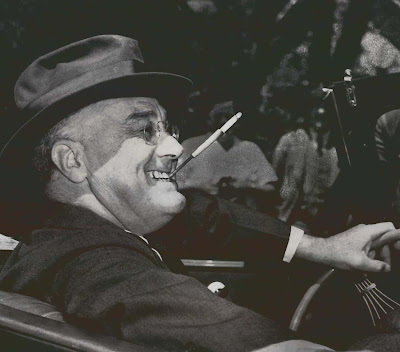 The cover also suggests hope; after all, FDR is considered one of our greatest presidents, his administration the architect of social programs that helped America pull out of the 1930's - 1940's depression. I remember that each month as my husband's Social Security appears in our bank account. Barack Obama's presidential history is yet to be written, but it's an exciting time to be alive and to be able to witness firsthand one of the most important times of the modern era. 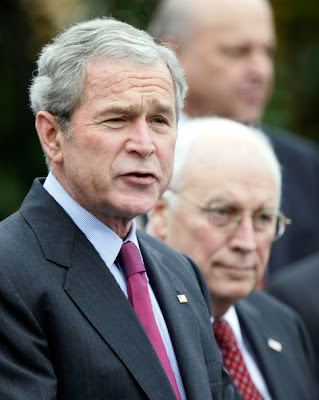 We need to believe again in our government; the past eight years have been a depressing and embarrassing time as George W. Bush mangled the English language and made policy decisions that have left us scratching our heads. Just after the 2004 election, Bush bragged about his slim victory handing him "political capital," and that he was now going to "spend" it to promote the policies he wanted. Squandered is more like it. Barack Obama has earned true political capital, but I doubt very much if this articulate man will go on national television and brag to the people who did not vote for him; he's much too classy. I predict that President Obama will spend his political capital carefully, for the policies that really matter. Will I agree with every decision he makes? Probably not. But it sure does feel good to be able to BELIEVE again. Are some people simply doomed to perennial poverty and/or chronic indebtedness? I think so. For whatever reason--drugs, overspending, misplaced generosity--some people will allow a windfall to simply slip through their fingers. I once saw clips from a documentary called Reversal of Fortune; filmmaker Wayne Powers wanted to carry out a social experiment in which he would give Ted Rodrigue, a Pasadena homeless man, $100,000, with only one string attached: that Powers be allowed to film Rodrigue as he spent his unexpected windfall. Powers wanted to prove or disprove the social theory that money is the way out of chronic poverty. What would you do with $100,000 if you were homeless? Find out what this man did with it. The Power of Personality: What Happens When You Give a Homeless Man $100k? 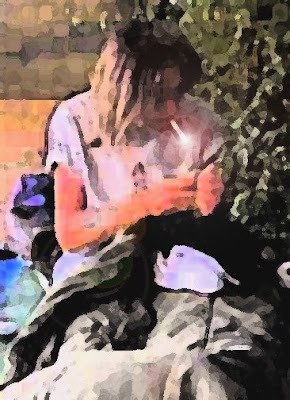 The homeless are different from you and me, and it's not because they have less money. It's because they are extraordinarily low in what personality psychologists call conscientiousness. That's my theory, anyway. A quite watchable documentary on Showtime (and that's high praise from me, I strongly prefer fiction) puts my theory to the test. It's called "Reversal of Fortune," and it's got a simple set-up: The film-makers picked Ted, a homeless man in Pasadena, gave him $100,000, and filmed the results. We initially see Ted's life on the streets. He sleeps under a bridge and does enough recycling to pay for beer, cigarettes, and a little food. He is surprisingly articulate - low IQ is not his problem. It would be easy for someone to argue that Ted has simply been unlucky, and that his drinking is "just a response to the hopelessness of his situation." Ted's case suggests that money alone is not the way out of poverty. Evidently, Ted felt comfortable in his life, that the windfall was actually a source of conflict for him. Of course, Ted's case is not definitive proof; had the windfall been given to a working person who was temporarily down on his luck, the outcome probably would have been different. I have often thought about what I'd do with a $100,000 windfall (if I were homeless and down on my luck, that is, and not an alcoholic or druggie). 1. I'd find a modest furnished place to live. Having a roof over my head and decent bathroom and kitchen facilities would be top priority. 2. I'd buy some decent clothes (for every day and job hunting) and lots of soap and towels for bathing. 3. I'd invest in a used car; these days, flexible and reliable mobility is almost as important as having a place to live (unless I lived in a metropolitan area with reliable public transit). 4. I would buy myself a decent meal and then go grocery shopping for staples. 5. I would invest the rest of the money in a short-term CD (so that I could think about what to do with it without making an impulsive decision). I would be willing to work at any crap job, just to get on my feet. 6. For long term, I would buy a modest house or condo and furnish it with furniture from Goodwill--just the basics: table and chairs, sofa, bed, maybe a cheap TV (but no cable). I would go to the library for internet and books and other reading. 7. I would look into job training or college (I would continue working, although I would always be on the lookout for a better-paying job). For me, a $100,000 windfall would be an opportunity to better my life. 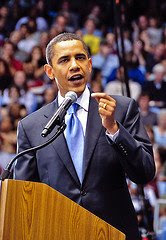 On the campaign trail, Obama discussed "Ownership Society"
Yesterday, I posted an Obama quote on Ownership Society; while I agree with much of what he says about society's responsibility toward the down and out, I have some reservations, which, I suspect, is felt by most of the middle class. Back in 1989, after five years of financial struggle, my husband and I bought our first house together (we both had been married before). It was a tough time to be buying a home; home mortgage rates were high, 10-11 percent, as were home prices, but we knew that if we didn't buy soon, a window of opportunity for home ownership might close. I was in my late 30's and my husband in his late 40's, so the prospect of having a mortgage payment well into our 60's and 70's was a bit daunting. We could not afford the house we *wanted*, so we had to settle for a modest city home at our maximum price of $67,500 (at that time, the average home was about $150,000), which was, because of credit card and other loan debts, our absolute limit. So we opted for a no-down payment VA fixed-rate mortgage at nine percent, with closing costs folded in. For the next seven years (as we paid down other debt and sent a son through college), it was tough going; many months, we wondered where we were going to scrape up the house payment, but somehow we made all our loan payments and always on time. Slowly, we crawled out of debt and started saving; once we retired a loan, we would continue making payments--to our own bank account. Old car payments? Right into the new car account. When my son graduated from college and he was safely on his own, we funneled that money into the bank on the premise that we wouldn't miss what we never had. That became our "travel" account. Had we bought our $150,000 dream house, no doubt we would have sunk into a nightmare scenario and fast; the money simply wasn't there. Most certainly, we would have ended up in bankruptcy and foreclosure and in even more debt. It never occurred to us to ask for government help or to file for bankruptcy; pay by pay, we simply paid down our debt until it was gone. After all, for better or worse, these were OUR financial obligations. We didn't ask anyone, government or anyone else, for a handout. On the positive side, my husband has a good job with great benefits, so we haven't had to worry about medical bills; also his salary has increased steadily. The financial and health Gods have been on our side. Harry Homeowner, a college professor, and his wife Harriet, a teacher's aide, earn $100,000 per year; they buy a $500,000 McMansion with a five-year interest-only mortgage with a balloon payment of the principal at the end. After struggling during those five years, the day of reckoning has arrived, and they still owe the bank the original $500,000. Meanwhile, due to downsizing, Harriet has lost her job, and they don't qualify for refinancing, so now the bank has foreclosed and they must move. Sorry, I'm unsympathetic; Mr. and Mrs. Homeowner simply bought more house than they could reasonably afford. They wanted a fancy house and allowed themselves to be snookered into thinking that a no-principal loan would be a good idea. It was a risky proposition, and they lost. Why should I, a responsible borrower, be taxed to support the greedy aspirations of less responsible borrowers? Why should they be able to stay in their expensive McMansion on my dime while I continue living in my more modest home? This is my main fear: those of us who did the responsible thing will be forced to subsidize those who were greedy. That doesn't seem very equitable. Now let's look at Harry's brother and sister-in-law: Joe Homeowner, a construction worker, and his wife Jane, a food-service worker, make $75,000 per year. After doing a lot of financial calculations, they realize that they can't afford more than $150,000 for a house and that is pushing it to their limit. They decide on a $125,000 home--not exactly their dream home, but with $25,000 down (saved over the past five years), they will get a six percent fixed 30-year mortgage. The plan is to prepay whenever possible and pay the loan off within 20 years. However, five years into the mortgage, Joe suffers a major heart attack and is laid up for six months. While Joe receives disability pay, it is only 50% of his take-home pay. Also, because of his illness, Joe can no longer do heavy construction work, so he loses his job and insurance coverage; they fall behind on their mortgage payments, so their bank will be foreclosing, and they will have to move. This is a case where "spreading the wealth" makes sense. Joe and Jane did all the right things, but unexpected circumstances threw them behind the eight ball. Joe and Jane should be given stop-gap mortgage help and medical and tuition relief for Joe as he retrains for another career. In Obama's plan, I hope that there will be a mechanism in place so that the responsible Joe and Jane will get the relief they need, and yet Harry and Harriet will not be rewarded for their irresponsible financial behavior. Yes, they should also receive some limited help, but they may have to move from their fancy home and into more modest digs or assume a 40-year loan. Irresponsible behavior should carry serious and difficult consequences. And what about a tax credit for those middle class families who have paid their bills on time and do not require a government bailout? The idealistic Barack Obama is on the right track when he says that all Americans, no matter how poor, should enjoy the basics of life, such as food, shelter, clothing, education, work, and health care. But here's the bald truth: no matter how many social nets we set up, we will always have the poor among us. Short of committing every indigent person to institutions and removing their children from their homes and placing them in orphanages, there isn't much a government can do to save people from destructive behaviors that keep them in poverty. It's just the way the human race is wired. I promised that this blog would not blindly espouse every opinion that Obama holds; I deeply admire him, but he's human and subject to gaffes and I don't agree with his policies 100%. Before embarking on his historic November 10, 2008, meeting with President Bush, President-Elect Barack Obama sends Sasha and Malia, his children, off to school. 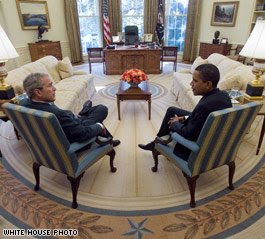 George W. Bush and Barack Obama meet in the Oval Office (November 10, 2008). A few minutes ago, NBC cut into programming to show live coverage of President-Elect Obama and wife Michelle Obama arriving at the White House for a special meeting with President Bush. According to Brian Williams, this is a historic event; typically, the White House meeting between current and future president usually takes place much later, some time in December. In light of the contentious campaign season, this is an unprecedented move. 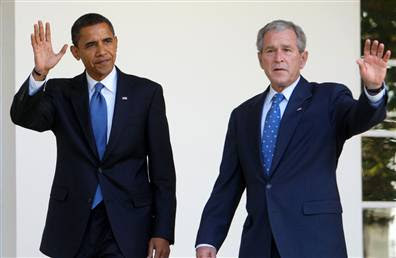 Obama was particularly harsh on George Bush and his archaic policies, so it may seem puzzling that Bush would offer such a warm welcome to a man who tore into his policies. But I think I understand why Bush is being so accommodating. Remember the Clinton-Bush transition? How outgoing White House staffers removed all the "W's" from the White House keyboards? How the Clintons removed some expensive trinkets from the premises that weren't really theirs to take? Unfortunately, such antics cast a dim light on a presidency that had been fairly successful (well, minus the Lewinsky nonsense and the impeachment proceedings). Granted, the 2000 election was utter chaos, and we'll probably never really know who won Florida and, consequently, the 2000 election, but the Clinton antics reflected more negatively on Clinton than George W. Bush, who, at that time, was making grandiose promises to engage in "compassionate conservatism" by reaching across the partisan aisle. Among the American people, who were largely willing to offer Bush the benefit of the doubt, the new president enjoyed the glow of the Honeymoon period, and Clinton simply looked like ugly sour grapes. 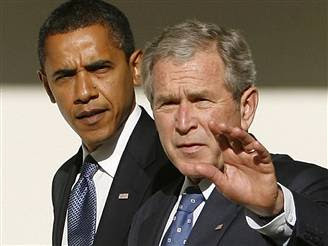 I suspect that Bush is making an attempt to salvage some of his legacy by not acting out against the new president-elect; let's face it, Bush's presidency has been a disaster, and history is going to be harsh on the bumbling and stammering Number 43, who made unsound decisions, both foreign and domestic. Also, from all accounts, Bush has a genuine fondness for Barack Obama and is able to separate the personal from the political, a trait inherited from Bush, Sr., who still maintains a friendship with Bill Clinton. Okay, so today is kumbaya time, but what about the immediate future? Will the rest of the transition go as smoothly? Or as Obama's agenda begins to gel against Republican policies and conservatism, will the knives come out? According to Valerie Jarrett, co-chairman for the President-elect transition team, Obama, on January 20 (or shortly thereafter), may overturn some of Bush's more controversial policies, such as his ban on stem-cell research. Will Bush take these probabilities as personal affronts? I have almost finished reading the Newsweek article (see yesterday's post)--now enjoying the the "dishy" antics of one Sarah Palin. Unfortunately, we haven't seen or heard the last of the "Gotcha Girl." On Tuesday, Americans stood in lines that stretched around schools and churches in numbers this nation has never seen. It didn’t matter who they were or where they came from; what they looked like or what party they belonged to – they came out and cast their ballot because they believed that in this country, our destiny is not written for us, but by us. We should all take pride in the fact that we once again displayed for the world the power of our democracy, and reaffirmed the great American ideal that this is a nation where anything is possible. This week, I spoke with President Bush, who graciously offered his full support and assistance in this period of transition. Michelle and I look forward to meeting with him and the First Lady on Monday to begin that process. This speaks to a fundamental recognition that here in America we can compete vigorously in elections and challenge each other’s ideas, yet come together in service of a common purpose once the voting is done. And that is particularly important at a moment when we face the most serious challenges of our lifetime. Yesterday, we woke to more sobering news about the state of our economy. The 240,000 jobs lost in October marks the 10th consecutive month that our economy has shed jobs. In total, we’ve lost nearly 1.2 million jobs this year, and more than 10 million Americans are now unemployed. Tens of millions of families are struggling to figure out how to pay the bills and stay in their homes. Their stories are an urgent reminder that we are facing the greatest economic challenge of our lifetime, and we must act swiftly to resolve them. In the wake of these disturbing reports, I met with members of my Transition Economic Advisory Board, who will help guide the work of my transition team in developing a strong set of policies to respond to this crisis. While we must recognize that we only have one President at a time and that President Bush is the leader of our government, I want to ensure that we hit the ground running on January 20th because we don’t have a moment to lose. We discussed several of the most immediate challenges facing our economy and key priorities on which to focus in the days and weeks ahead to ease the credit crisis, help hardworking families, and restore growth and prosperity. First, we need a rescue plan for the middle class that invests in immediate efforts to create jobs and provides relief to families that are watching their paychecks shrink and their life savings disappear. Then, we’ll address the spreading impact of the financial crisis on other sectors of our economy, and ensure that the rescue plan that passed Congress is working to stabilize financial markets while protecting taxpayers, helping homeowners, and not unduly rewarding the management of financial firms that are receiving government assistance. Finally, we will move forward with a set of policies that will grow our middle-class and strengthen our economy in the long-term. We can’t afford to wait on moving forward on the key priorities that I identified during the campaign, including clean energy, health care, education and tax relief for middle class families. Let me close by saying I do not underestimate the enormity of the task that lies ahead. We’ve taken some major actions to date, and we will need further actions during this transition and subsequent months. Some of those choices will be difficult, but America is a strong and resilient country. I know that we will succeed if we put aside partisanship and work together as one nation. And that is what I intend to do. It looks as though the Obama team has started the hard work of getting the President-Elect's administration set up early and ready to roll on January 21, 2009 (Let the country party on the 20th). Wow, how hip is that? Some elitists in the domaining community (those who buy domain names to resell and/or set up mini-sites) are criticizing Barack Obama for not acquiring Change.com ("Dotcom is King"); however, this man has already pulled off the near-impossible, so I have no doubt that Change.gov will become THE hippest address on the web. Remember: I said it here! but finding the Time issue proved almost elusive. I finally found one copy at CVS for the regular price of $4.95, although if I wouldn't have found it, there's a copy for sale on eBay for $5,000.00 (Yeah, right). I look forward to receiving The New Yorker issue (if no one swipes it). I'm still reading the Newsweek coverage, about halfway through--wow, what in-depth coverage. 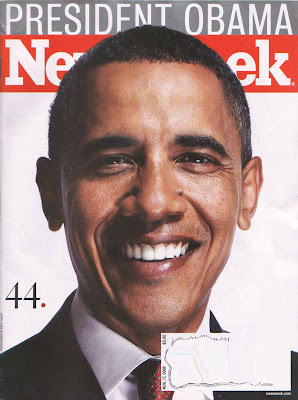 Newsweek reporters, embedded for almost two years in all the campaigns (Obama, McCain, and Clinton), essentially were gagged until after the election; that is almost a permanent job. Although I'm not a huge fan of People magazine, the cover looks smart, so I picked that up as well. Plenty of those copies left. I'll skip the stuff about Beyonce (or whatever her name is these days). Anyway, I'm getting my Obama collectible fix (although these items will be more of a historical value than monetary since everyone is collecting this memorabilia). In the Newsweek issue, some of the campaign dish is quite interesting, particularly in the McCain and Clinton camps (although the Obama team hasn't gotten off scott-free). I'm sure that the McCain camp enjoyed some high drama in that last two months of the Palin era. I'll probably have more to say once I have finished savoring, uh, reading it. When Barack Hussein Obama II was born on August 4, 1961, I was 10 years old, and John F. Kennedy had been president for just seven months. 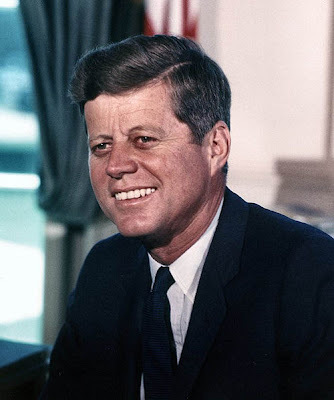 As a Catholic, I was ecstatic when I first heard that Kennedy had been selected as the Democratic nominee. I rode my bicycle throughout the neighborhood, whooping it up and yelling the news like a pesky town crier. It never occurred to me that anyone else would feel any differently; in my mind, Kennedy's nomination and eventual win were inevitable as apple pie, the American flag, and the True and Apostolic Church. Certainly (in my 10-year-old mind), Kennedy would be a good Catholic president. So I understand completely how African-Americans might feel that Obama is their president, at least in these early days. No doubt that this is truly a historic time in our country and an "about time" moment. However, just as Kennedy proved definitively that he was not taking direct orders from The Vatican, Obama is not likely to take orders from the NAACP or any other group. He will listen, of course, but he will do what is best for the country as a whole--at least this is my hope. 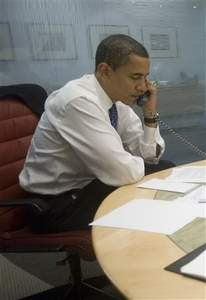 Right now, Obama is enjoying rock star status among African-Americans and young people, but here's my fear: the honeymoon will come to an abrupt end when it sinks in that Obama may not be able to deliver instant results in African-American issues or that these issues may not even be the highest priority. In fact, I see a bit of a backlash, especially in the area of affirmative action in that the the victim card will be less compelling now that an African-American (who basically started life without special connections) has achieved the highest office; in fact, I have already heard this argument among some friends and family. Right or wrong, it's there. Once the headiness of victory has diminished, we should all take a look at our expectations of this young president-elect and ask what our country as a whole needs from him, not just any one ethnic group. Like Kennedy, Barack Obama will be the people's president and will need to make some difficult decisions that may not please everyone. Thanks to Bush, Obama will have a lot of messes to clean up, and I would be surprised if he'll be able to achieve it all in the first four years (assuming he wins a second term). Back in 1961, I was just a child, without the awareness that the world is a more complicated place than just Catholic vs. non-Catholic, so throughout my childhood, JFK, for me, was the Catholic president. Later on, of course, it turned out that JFK saw himself as being a Catholic second and politician and leader who represented everyone, not just Catholics. He was truly the people's president. Had Nixon won the presidency, I would have surely been crushed and disappointed. 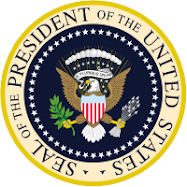 Luckily, I got my way, and on January 20, 1961, Kennedy was sworn as our 35th President. I vaguely remember a very old man named Robert Frost reciting from memory a poem called "the Gift Outright" (originally he had planned to read "Dedication," but the brilliant sunlight caused too much glare on the page and he couldn't read the handwritten poem). I clearly remember JFK's most famous quote: "...Ask not what your country can do for you - ask what you can do for your country." Even at 10, I realized the historical importance of that plea; Obama would do well to consider those historic words as he embarks on this very exciting and frightening adventure. But neither can two great and powerful groups of nations take comfort from our present course — both sides overburdened by the cost of modern weapons, both rightly alarmed by the steady spread of the deadly atom, yet both racing to alter that uncertain balance of terror that stays the hand of mankind's final war. Let both sides unite to heed in all corners of the earth the command of Isaiah — to "undo the heavy burdens ... and to let the oppressed go free." In your hands, my fellow citizens, more than mine, will rest the final success or failure of our cause. Since this country was founded, each generation of Americans has been summoned to give testimony to its national loyalty. The graves of young Americans who answered the call to service surround the globe. Now the trumpet summons us again — not as a call to bear arms, though arms we need; not as a call to battle, though embattled we are — but a call to bear the burden of a long twilight struggle, year in and year out, "rejoicing in hope, patient in tribulation" — a struggle against the common enemies of man: tyranny, poverty, disease, and war itself. In the long history of the world, only a few generations have been granted the role of defending freedom in its hour of maximum danger. I do not shrink from this responsibility — I welcome it. I do not believe that any of us would exchange places with any other people or any other generation. The energy, the faith, the devotion which we bring to this endeavour will light our country and all who serve it — and the glow from that fire can truly light the world. 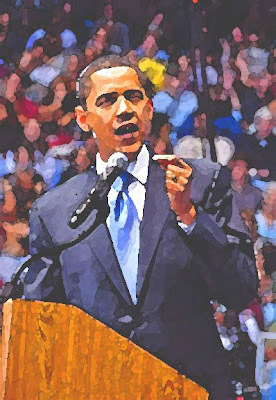 Full text of Obama's prepared remarks, delivered at his November 7, 2008, press conference (Chicago, Illinois). With that, let me open it up for some questions. And I’m going to start right here with you. Q: Thank you, Mr. President-elect. I wonder what you think any president can accomplish during their first 100 days in office to turn the economy around? How far can you go? And what will be your priorities on day one? OBAMA: Well, I think that a new president can do an enormous amount to restore confidence, to move an agenda forward that speaks to the needs of the economy and the needs of middle-class families all across the country. I’ve outlined during the course of the campaign some critical issues that I intend to work on. We have a current financial crisis that is spilling out into rest of the economy, and we have taken some action so far. More action is undoubtedly going to be needed. My transition team is going to be monitoring very closely what happens over the course of the next several months. The one thing I can say with certainty is that we are going to need to see a stimulus package passed either before or after inauguration. We are going to have to focus on jobs, because the hemorrhaging of jobs has an impact, obviously, on consumer confidence and the ability of people to ... buy goods and services and can have enormous spillover effects. And I think it’s going to be very important for us to provide the kinds of assistance to state and local governments to make sure that they don’t compound some of the problems that are already out there by having to initiate major layoffs or initiate tax increases. So there are some things that we know we’re going to have to do, but I’m confident that a new president can have an enormous impact. That’s why I ran for president. Q: (OFF-MIKE) from House Democrats that the stimulus package may be in trouble, that it’s going to be a hard time getting out of a lame-duck session. Are you still confident that you would be able to get something done before you actually take office? OBAMA: I want to see a stimulus package sooner rather than later. If it does not get done in the lame-duck session, it will be the first thing I get done as president of the United States. Q: Senator, for the first time since the Iranian revolution, the president of Iran sent a congratulations note to a new U.S. president. I’m wondering if, first of all, if you responded to President (Mahmoud) Ahmadinejad’s note of congratulations and, second of all, and more importantly, how soon do you plan on sending low-level envoys to countries such as Iran, Syria, Venezuela, Cuba, to see if a presidential-level talk would be productive? OBAMA: I am aware that the letter was sent. Let me state ... repeat what I stated during the course of the campaign. Iran’s development of a nuclear weapon I believe is unacceptable. And we have to mount an international effort to prevent that from happening. Iran’s support of terrorist organizations I think is something that has to cease. I will be reviewing the letter from President Ahmadinejad, and we will respond appropriately. It’s only been three days since the election. Obviously, how we approach and deal with a country like Iran is not something that we should, you know, simply do in a knee-jerk fashion. I think we’ve got to think it through. But I have to reiterate once again that we only have one president at a time. And I want to be very careful that we are sending the right signals to the world as a whole that I am not the president and I won’t be until January 20th. Q: Picking up what we were just talking about, your meeting with President Bush on Monday. When — he is still the decider, obviously, stating the obvious. When you disagree with decisions he makes, will you defer? Will you challenge? Will you confront? And if it becomes confrontational, could that rattle the markets even more? 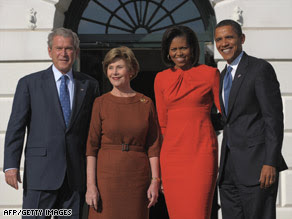 OBAMA: Well, President Bush graciously invited Michelle and I to — to meet with him and first lady Laura Bush. We are gratified by the invitation. I’m sure that, in addition to taking a tour of the White House, there’s going to be a substantive conversation between myself and the president. I’m not going to anticipate problems. I’m going to go in there with a spirit of bipartisanship and a sense that both the president and various leaders in Congress all recognize the severity of the situation right now and want to get stuff done. And, you know, undoubtedly there may end up being differences between not just members of different parties, but between people within the same party. The critical point and I think the critical tone that has to be struck by all of us involved right now is the American people need help. This economy is in bad shape. And we have just completed one of the longest election cycles in recorded history. Now is a good time for us to set politics aside for a while and think practically about what will actually work to move the economy forward. And it’s in that spirit that I’ll have the conversation with the president. Q: Thank you, Mr. President-elect. With the country facing two wars and a financial crisis, do you think it’s important for you to move especially quickly to fill key cabinet posts, such as treasury secretary and secretary of state? OBAMA: When we have an announcement about cabinet appointments, we will make them. There is no doubt that I think people want to know who’s going to make up our team. And I want to move with all deliberate haste, but I want to emphasize deliberate as well as haste. I’m proud of the choice I made of vice president, partly because we did it right. I’m proud of the choice of chief of staff, because we thought it through. And I think it’s very important, in all these key positions, both in the economic team and the national security team, to ... to get it right and not to be so rushed that you end up making mistakes. I’m confident that we’re going to have an outstanding team, and we will be rolling that out in subsequent weeks. Q: Yes, sir. To what extent — to what extent are you planning to use your probably pretty great influence in determining the successor for your Senate seat? And what sort of criteria should the governor be looking at in filling that position? OBAMA: This is the governor’s decision; it is not my decision. And I think that the criteria that I would have for my successor would be the same criteria that I’d have if I were a voter: somebody who is capable; somebody who is passionate about helping working families in Illinois meet their ... meet their dreams. And I think there are going to be a lot of good choices out there, but it is the governor’s decision to make, not mine. OBAMA: What happened to your arm, Lynn? Q: I cracked my shoulder running to your speech on election night. OBAMA: I think that was the only major incident during the ... the entire Grant Park celebration. Q: Thank you for asking. Here’s my question. I’m wondering what you’re doing to get ready. Have you spoken to any living ex-presidents, what books you might be reading? Everyone wants to know, what kind of dog are you going to buy for your girls? Have you decided on a private or public school for your daughters? OBAMA: Let ... let me list those off. In terms of speaking to former presidents, I’ve spoken to all of them that are living. Obviously, President Clinton — I didn’t want to get into a Nancy Reagan thing about, you know, doing any seances. I have reread some of Lincoln’s writings, who’s always an extraordinary inspiration. And, by the way, President Carter, President Bush, Sr., as well as the current president have all been very gracious and offered to provide any help that they can in this transition process. With respect to the dog, this is a major issue. I think it’s generated more interest on our Web site than just about anything. We have ... we have two criteria that have to be reconciled. One is that Malia is allergic, so it has to be hypoallergenic. There are a number of breeds that are hypoallergenic. On the other hand, our preference would be to get a shelter dog, but, obviously, a lot of shelter dogs are mutts like me. So ... so whether we’re going to be able to balance those two things I think is a pressing issue on the Obama household. And with respect to schools, Michelle will be — will be scouting out some schools. We’ll be making a decision about that in the future. Q: You are now privy to a lot of intelligence that you haven’t had access to before, in fact, much of what the president sees, I’m sure all of it. First of all, do you — what do you think about the state of U.S. intelligence, whether you think it needs beefing up, whether you think there’s enough interaction between the various agencies? And, second of all, has anything that you’ve heard given you pause about anything you’ve talked about on the campaign trail? OBAMA: I have received intelligence briefings. And I will make just a general statement: Our intelligence process can always improve. I think it has gotten better. And, you know, beyond that, I don’t think I should comment on the nature of the intelligence briefings. That was a two-parter. Was there another aspect to that? OBAMA: OK, I get you. Q: ... whether anything has given you pause. OBAMA: I’m going to skip that. Q: Mr. President-elect, do you still intend to seek income tax increases for upper-income Americans? And if so, should these Americans expect to pay higher taxes in 2009? OBAMA: The ... my tax plan represented a net tax cut. It provided for substantial middle-class tax cuts; 95 percent of working Americans would receive them. It also provided for cuts in capital gains for small businesses, additional tax credits. All of it is designed for job growth. My priority is going to be, how do we grow the economy? How do we create more jobs? I think that the plan that we’ve put forward is the right one, but, obviously, over the next several weeks and months, we’re going to be continuing to take a look at the data and see what’s taking place in the economy as a whole. But, understand, the goal of my plan is to provide tax relief to families that are struggling, but also to boost the capacity of the economy to grow from the bottom up. All right. Thank you very much, guys. Bush crawled out of his hidey-hole and met with his White House staff yesterday. He addressed his people, who are (at this moment) dusting off their resumes and getting ready to flee Titanic Bush. Suddenly, 73+ days to inauguration look awfully long. 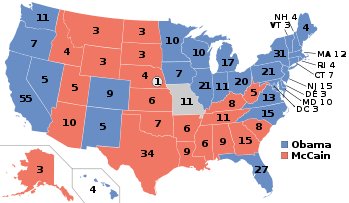 According to the Wiki map, Missouri is still too close to call. President-Elect Barack Obama has announced his Chief of Staff today. "I announce this appointment first because the Chief of Staff is central to the ability of a President and Administration to accomplish an agenda," said Obama. "And no one I know is better at getting things done than Rahm Emanuel." 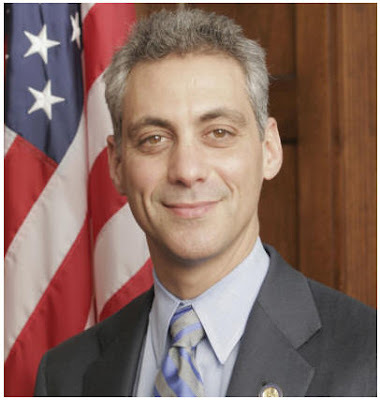 From 1993-1998, Democrat Rep. Rahm Emanuel, 48, was a senior advisor to Clinton at the White House. He was also a leading strategist for Clinton's failed universal health care initiatives. As a citizen, I have some reservations about Emanuel (who is considered to be a political insider), but much will depend on Obama's other staff. For now, I will trust that Obama has made a wise choice. I would hope that the President-elect, in keeping with his campaign promise of change, would also select some "outsiders" for his staff and Cabinet. Today is brick wall reality day. Yesterday, after posting Barack Obama's stunning victory speech and Martin Luther King's classic "I Have a Dream" speech, I sank into a political funk; over the past month or so, I had become a political and news network junkie, surfing between CNN and MSNBC, and, yes, even Fox network (more on that later). I promised my better half that I'd go cold turkey on November 5, but that hasn't quite worked out yet. It seems as though the siren call to the talking political heads is still much too seductive. The Morbid and Mortality analyses of the Republican party are quite fascinating to note, especially from the same experts who warned of an extremely close election. Funny how the same old info takes on new meaning the days after the election. Bottom line: I'm thrilled that Obama was elected, but now that the Adrenalin high is gone, I'm feeling a bit flat line, so there is a slight spike upward when I tune into Keith "The Chief" Olbermann, Larry King, Rachel Maddow, Rick Sanchez, Bay and Pat Buchanan, Paul Begala, and, yes, Mike Huckabee. I have spent the last month wondering if we were going to experience another Florida (or Pennsylvania or Ohio) and that an Obama defeat would be snatched from the jaws of victory--I'm highly suspicious of Republican mucky mucks, especially those Bushies. As citizens, we have to get past the campaign rhetoric and consider what is realistic for one man to accomplish. I don't envy President-elect Obama's difficult job ahead. 1. He is largely unknown, for we have only his campaign speeches and behavior to go by. Do we really know his intentions for how he plans to govern this country? 2. His great charisma scares me a bit because, as we all know, charisma without conscience can be a dangerous mix. So let's hope that his charisma is not a mask for anything nefarious. Fortunately, only a few negative issues arose during the campaign, Jeremiah Wright being the most troubling--we can't ignore this association, and Hillary Clinton and the Republicans were right to expose it (although for all the wrong reasons). 3. His resume is a bit thin, although I believe that his astounding intellect and grace under pressure will serve him well. Also, his cabinet choices will reveal the direction of his presidency. As of today, Obama has asked Rep. Rahm Emanuel of Illinois, a Democratic lawmaker known for a hard-charging style, to lead his White House staff. Emanuel has accepted the job. Also, Obama is considering Timothy Geithner, president of the Federal Reserve Bank of New York, former Treasury Secretary Lawrence Summers and former Federal Reserve Chairman Paul Volcker for the Treasury post. Valerie Jarrett, a close Obama friend, is heading up the transition team (Reuters). 4. Which brings me to the cronyism issue: while I can appreciate why Obama would want to surround himself with close and trusted friends, I would also hope that he would go outside of his inner circle and select ethical experts, even Republicans, who would help steer him in the right direction should he lose his way. Everyone in power needs a point person who will not be afraid to tell the emperor when he's not wearing clothes. All during the campaign, we heard both candidates repeating the "reaching across the aisle" manta/cliche. Now will it really happen in an Obama presidency? I sincerely hope so. 5. Finally (and this is big), will Obama be every one's president? As a Caucasian middle-aged woman, I voted for Obama because he was, in my opinion, the best choice. Race had nothing to do with how I voted. It would be dangerous if he became known as "The Black President"; there are too many people in this country who have not moved beyond race and their fears, and Obama will need to assure them that he represents all Americans. Closing thoughts for today: while I was thick into my news junkie phase and my two favorite sources (CNN and MSNBC) were repeating programs I had already viewed, I flipped over to Fox, where I discovered Mike Huckabee's show. Now I disagree with about everything Huckabee believes, but I was impressed by his demeanor and attitude toward his guests. He admitted that he loves having moderates and liberals on his show, and, evidently, they love being there. On the night I tuned in, Huckabee's guests were Richard Dreyfus and Bill Maher. There was no shouting or name calling, just smart discussion of political issues. Huckabee is anything but wishy washy on his views, but some other talk show hosts (specifically Olbermann, Matthews, and O'Reilly) could take a page from Huckabee's book by treating their guests with respect by truly listening. He does not interrupt or try to shout over their heads.